The gem that stands for wisdom, loyalty, and nobility, sapphire has been known to focus the mind and encourage self-discipline. In ancient times, it was reputed to have healing powers like curing boils and diseases of the eye and served as an antidote to poison. Most people think this gem only comes in royal blue but it actually has a rainbow of colors except red which is classified as ruby. This gives every September baby a variety of options when selecting the right shade. Now what makes sapphire extra special? Here are a few interesting facts about this sophisticated birthstone. One of the most durable naturally occurring elements in the world is sapphire. It scores a 9 out of 10 on a system called Mohs Scale of Mineral Hardness. The only stone that can scratch a sapphire is a diamond. Since it is durable, sapphire makes an ideal choice for engagement rings. Valued greatly for thousands of years, the ancient Romans were believed to polish sapphires as they considered them treasured jewelry. Rich blue sapphires are known as the crème de la crème among the variety of sapphire colors. The trace elements in the mineral corundum is where the sapphire stone acquired its color. Corundum pink comes from the trace elements of chromium and if there’s more of it, the stone is classified as ruby. 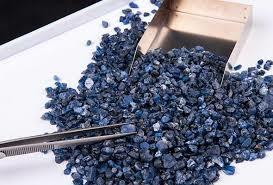 Blue sapphires have iron and titanium trace elements. England’s Prince Charles gave a sapphire engagement ring to Lady Diana Spencer in 1981 which is now worn by Princess Catherine. This is the most popular royal sapphire as of today. The ring has an 18-carat oval blue sapphire and is surrounded by diamonds. Sapphires often have a star effect or asterism which happens when needle-like inclusions form a six-ray star pattern on the surface of a cabochon-cut sapphire. This type of sapphire is often called star sapphire. Padparadshca, which is rooted from the Sanskrit word lotus flower, is the rarest type of sapphire with pinkish orange tone. Medieval kings donned plenty of sapphires as they believed these gems offered protection from their enemies. You can find sapphires in plenty of places in the world like Malawi, Madagascar, Sri Lanka, Australia, and the United States. The most interesting type of sapphire is the color change variety. Depending on the lighting, this type shows different colors — from purple in incandescent light to blue in daylight. Now that you already know a few facts about sapphires, don’t you think it’s time to buy one for your birthday? It doesn’t matter what color and cut you choose as long as you’re happy with it. This gemstone is majestic and if you take good care of it, you can keep it in the many years to come!